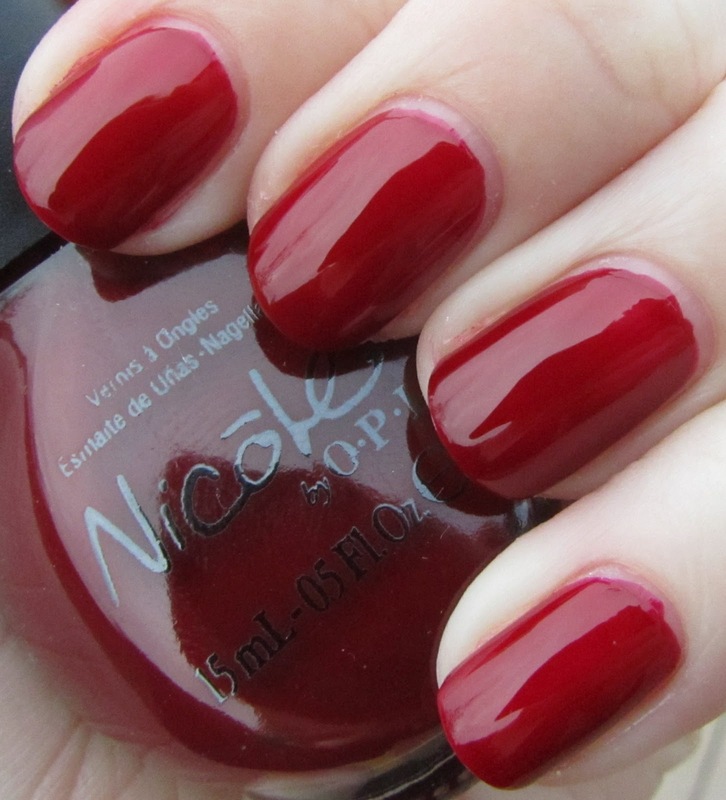 Polishology: Nicole by OPI Kardashian Kolors - Swatches and Review Part One! Nicole by OPI Kardashian Kolors - Swatches and Review Part One! My nails have been doing a bit better lately, so I am finally getting caught up on swatches! This is a collection that came out before the holidays, but you can still easily find it in stores, and it has some really fun colors in it that I definitely suggest you check out. Since it is pretty large (14 polishes), I will split it into two posts - here is the first half! 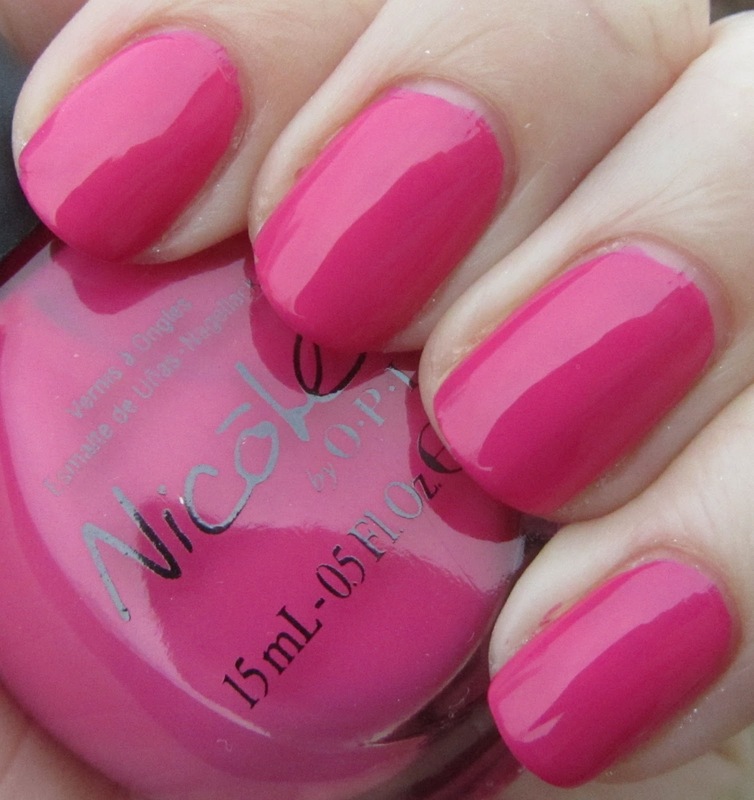 Vibrant hot pink creme. The color here is perhaps not anything unique, but it is a great hot pink and the formula was very nice - self-smoothing and a good consistency. Two coats for full coverage. Bright, cherry red creme. Again, not super unique, but a very nice choice for a red creme - same great formula, two coats for opacity. Deep blue-toned red. This one was a little more sheer - here I used two coats, but looking at it carefully now I perhaps should have applied a very thin third coat to even out a few spots. Very nice color, though. Dark chocolate brown creme. I hard a hard time accurately capturing this on camera. It looks just a bit too dark here - in person the brown did show through a bit more. However, it is very dark, and very pretty. Two easy coats. Makes me think of dark chocolate. Now I am hungry. Taupe creme. I feel like I like this color better on other people's skin tones than mine... it just looks too mucky on me, but I have seen this on some others where it looks really gorgeous. 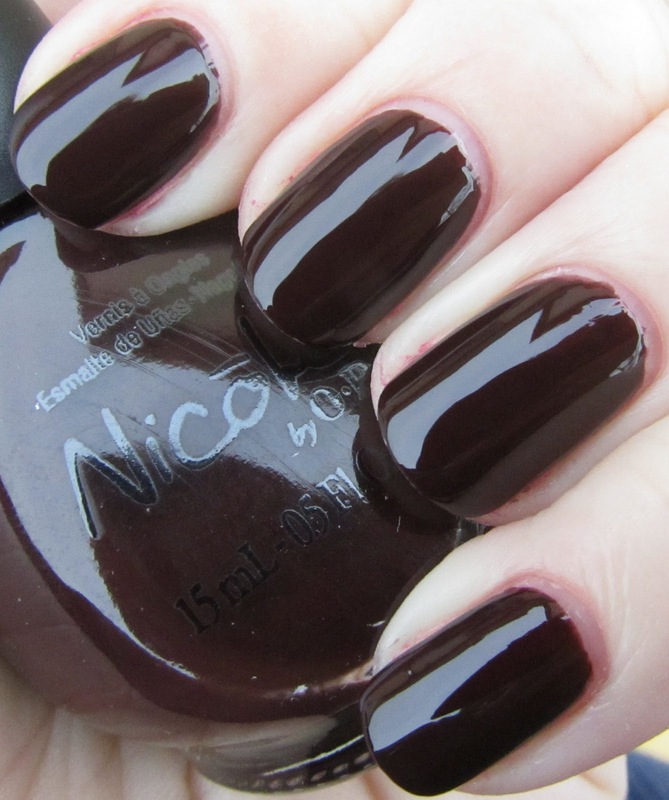 Same great formula as several of the other cremes, with two easy coats. 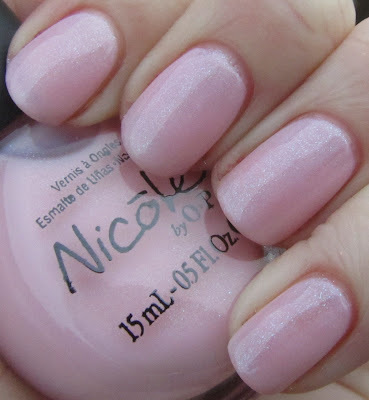 Light pastel pink full of blue and silver microshimmer. I love this one, even though I was not expecting to at the beginning. It is extremely sheer, and took me four coats to fully even out, but the shimmer is gorgeous. So wearable and girly and gorgeous. Sheer white with silver microshimmer. This one is also very pretty, as well as very sheer. Like Kim-pletely, this took four coats for full coverage. My favorites are the 3 first colors! Hey girl! I hope this doesn't sound weird... but 1) I love the way you're painting your nails lately... no more polish on the cuticles! 2) your nails look SOOO GOOD! Props! They look literally axxium or shellac'd in those photos! Woop woop! I like (and own) the last two and love them too!!! Despite the celebrities that inspired this collection (can't stand them, sorry) I really like a lot of these polishes! Can't wait to see your next post with the rest of them!